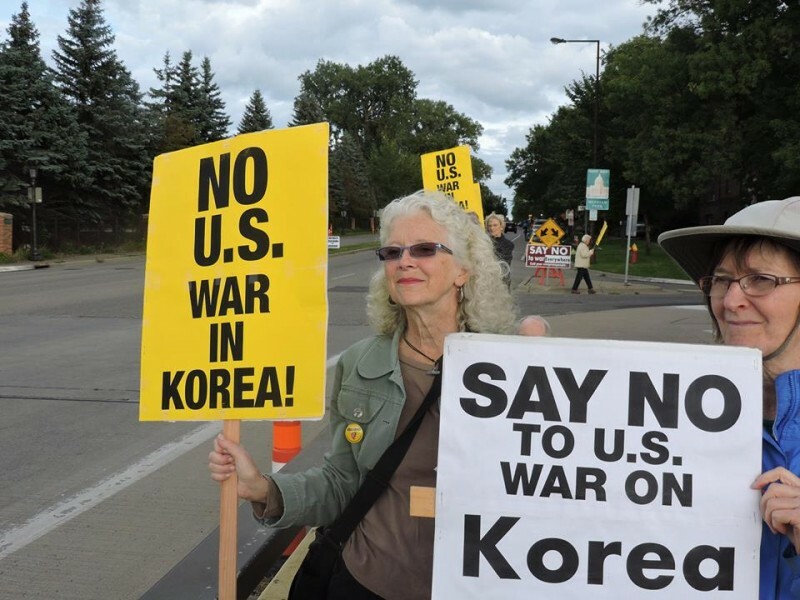 Twin Cities peace vigil speaks out on war crisis in Korea | Fight Back! 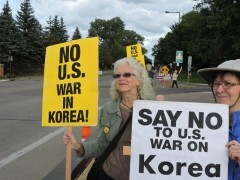 Minneapolis, MN - For the second week in a row, the organizers of a weekly peace vigil in the Twin Cities addressed the war crisis in Korea by holding a very visible anti-war event. The Sept. 6 event was attend by over 35 people who held signs against a U.S. war on north Korea. The vigil, sponsored by the End War Committee of Women Against Military Madness and the Twin Cities Peace Campaign, is held every Wednesday on the Lake Street/Marshall Avenue Bridge over the Mississippi River between Minneapolis and Saint Paul. The statement goes on to say, "There is a proposal to avert war and start talks, ‘freeze for freeze,’ in which north Korea suspends its nuclear and missile testing in exchange for halting or scaling back these massive U.S.-south Korean military exercises and for an a peace treaty to formally end the Korean War." "There is a real danger of a new U.S. war, everyone opposed must speak out. The weekly vigil is one way to speak out against war," the statement said. A number of other peace and anti-war groups joined the event, including Veterans for Peace, Minnesota Peace Action Coalition and the Anti-War Committee. Misty Rowan, a member of the Anti-War Committee (AWC), said, "The Anti-War Committee supports the right of Korea to self-determination. The U.S. government waged a genocidal war in the early 1950s, and now threatens more of the same. The AWC opposes all threats by the U.S. government against the Korean people." Rowan went on to say, "The U.S. is the last country that should be telling others how to handle nuclear capability, seeing as we are the only country that has dropped, not one but two, atomic bombs on the civilian population of another country. We are in no position to call Koreans irresponsible, when we have enough nukes to destroy the entire planet several times over. We should be worried about our own bombs."